Fuller's pub in Kingston, with an award-winning garden. It's quite nice inside, with traditional decor, exposed varnished floorboards, wood-and-glass privacy screens, and a stained-glass gantry over the bar. They have eight handpumps, and a sign outside in November 2015 stated that they usually have five real ales on. On our visit in that month, there were four on, all from Fuller's: Red Fox, Seafarers, London Pride, and ESB. A pint of lime and soda was £2. When bob visited in February 2008, the London Pride was very good. On Kake's Tuesday afternoon visit in November 2015, there were a couple of other people in when I arrived a little before 4pm, but no conversation at all. The radio was playing adverts and music. By 5:30pm there were several more people in and it was quite lively. Pleasingly, the music was not turned up as the level of conversation rose, meaning it remained possible to have a conversation without shouting. 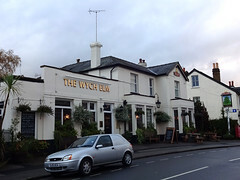 According to the Wych Elm website as of February 2016, food is served noon-3pm and 5pm-9:30pm Mon-Fri, noon-9:30pm Sat, and noon-8pm Sun. There's a regular menu plus a £5 specials menu photo of the latter in Nov 2015. In November 2015, Kake tried the chickpea and chorizo soup with garlic toast from the £5 specials menu photo. This was great; nicely softened chickpeas, a generous amount of chorizo, properly softened vegetables (carrots, red peppers, potatoes), and plenty of flavour in the soup itself. The garlic toast was garlicky but not overwhelmingly so, and made from decent bread with a good crust. I'd order this again. Northern Steve visited for a work Christmas meal in December 2008 — a set three-course meal which was perfectly acceptable for pub food. I ordered soup, steak and cheesecake. Tried the Fullers Christmas seasonal ale (forget the name) and several glasses of white. Service was good; they kept the wine bottles coming, as well as pints/coffees/etc. as required. They have free WiFi via O2, but you have to register for this (even if you've previously registered for O2 WiFi elsewhere), and this requires a mobile phone as they text you an activation code. Accessibility: A step to get in. No further steps to the toilets. Last visited by Kake, November 2015. Opening hours taken from the Wych Elm website, February 2016. Last edited 2016-02-01 11:55:20 (version 28; diff). List all versions. Page last edited 2016-02-01 11:55:20 (version 28).